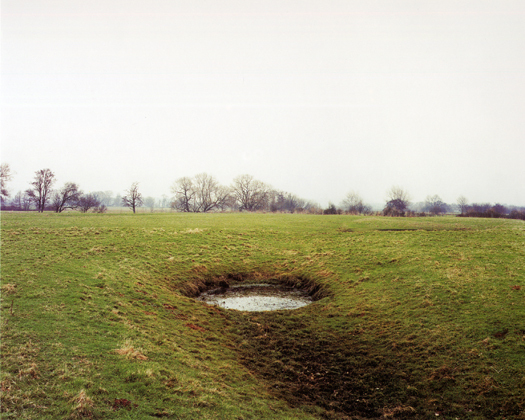 History is embedded deep within all of Jem Southam's photography, but one of the pictures that most resonated most with me is the one above, of a dew pond. 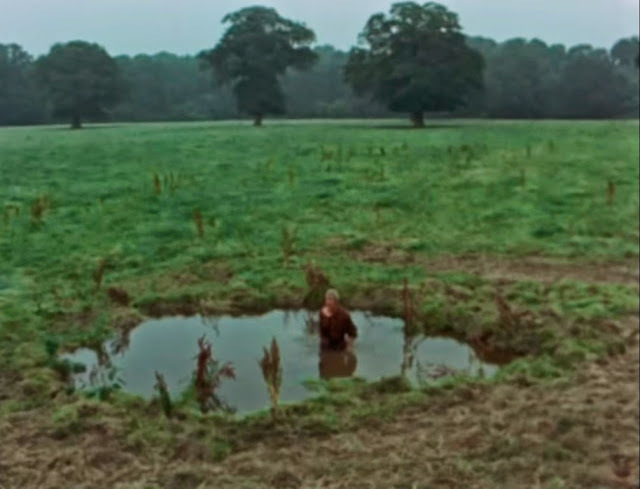 Indeed, the very idea of what a dew pond is struck me as something rather beautiful. These are man-made ponds in the middles of fields that fill with water (not the dew that gathers on the grass in the morning, but rainwater) for cows to drink. Some of them are very old (Oxenmere in Wiltshire dates back to Saxon times) so there is a sense of something ancient about them. They look old and they feel old. That's why they featured as the wormhole through which Catweazle travelled from the 12th to the 20th century in the, er, phenomenally popular 1970s TV series of the same name. Seeing Southam's pictures of dew ponds was for me like hearing a new word. It gave me a realisation of how the banal curves and contours of the land contain a profound history. And because of that suddenly I started becoming a bit more observant, and began looking for those curves and contours and what lies beneath them in the world around me. And once I started looking for them, the signs of the past became more apparent. The obvious ones are easy to see, but then new ones start creeping in and the land becomes a far less benevolent or pretty place. It seethes with venality and menace. In his work, Southam focusses on rockfalls, rivers, and ponds, places where the signs of geological, seasonal, and waterborne change are apparent. But this doesn't stand in isolation from human change and as you look at his pictures, this change starts to creep in too. The land begins to live and we become part of it. It changes the way you see things too. John Davies does the same thing with his more urban pictures. 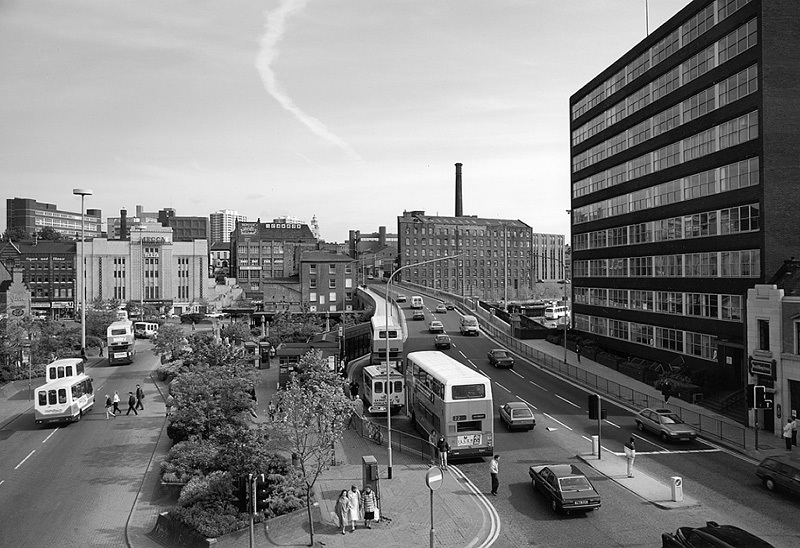 I always love seeing this picture of Mersey Square in Stockport. It always touched me because the warehouse with the chimney coming out behind it used to house a skateboard park. It wasn't a very good one, but it brings back fond memories for me. I showed this picture to a class one day and instantly one of the students dated it - 1986. He didn't get that from the captions, but from the number plates of the cars going up the A4. That's how he sees this urban environment, through the cars that drive through it. And then if I show it my dad, he sees a hat museum. Because Stockport has a long hat-making history and he was involved in that. Now I live on the edge of Bath, with the Avon Valley stretching before me to the south, Solsbury Hill to the east and Bath to the west. It's not the most dynamic of places but if I stand outside my house and look out, I can see a landscape that includes the following sites and histories. But the problem is how to photograph this history. You don't embed that history into a landscape just by snapping a picture or two. It is more difficult than that. What Jem Southam does looks incredibly easy, but there is something in the process that adds depth and ties the image to the lay of the land, that puts you in the place in a manner where the folds of the land, the geology, the history, the sensation comes through. I don't know how he does it. I believe Jem Southam's work is beyond something formal, and that there is a sense of mystery in there, that it is to do with his process of walking and being in and part of a place and the way in which that inhabits you in a non-photographic way. I like the idea that his photographic practice somehow mirrors the sensation of being in a place and of a place and connected to a place. And by being connected you connect others and you make the world grander and richer than it otherwise might be. And that is why Jem Southam's work is important and why he's talking at Beyond the Visual: Music, Word, and Landscape. Exactly what he'll be talking about is still a mystery however because Southam's talks are always different and always made in response to the when and the where of the occasion which makes things even more exciting. So there's another draw for you . Hi Colin, I really like the work of Southam, especially because I feel that is deeply linked with intimate histories (not with History). When I Iook at his work, I think that I could be a part of that landscapes, in a very deep and personal way. I think that is a sort of biographical affair. Thanks Gianluca - historical in a biographical, walking kind of way. For sure.